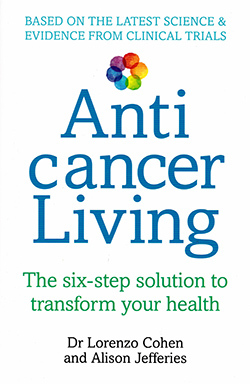 This excellent book provides an evidence-based guide for six cancer lifestyle choices that may reduce the risk of cancer developing, aid treatment efficacy and tolerability, and improve recovery and disease control after a cancer diagnosis. I would highly recommend this book to patients and clinicians, and have recommended it to my own family and friends. My only reservation is that parts of the book may be difficult for some to understand. It provides an excellent overview of cancer: what it is, the available treatments and how they work, with reference to the latest research. The evidence supports advice to adopt six inter-related anti-cancer living strategies: connect with social support, manage stress and build resilience, make time for rest and recovery, build movement into your day, treat food as medicine and avoid environmental toxins. The book aims to empower people to take control over a potential or actual cancer diagnosis that can engender fear and passivity. Meanwhile, interesting case studies bring the book to life. The passionate belief of the US-based authors – who are husband and wife – in the six strategies is demonstrated by the help they give to their own family and local community. The central message of the book comes from David Servan-Schreiber, an inspirational colleague of Dr Cohen who he followed for 19 years after his brain tumour relapsed. He writes in the book’s forward: ‘It’s within our power to reduce our risk of cancer or improve our chances of surviving a cancer diagnosis by changing the way we live’.